Kokaistudios’ recent renovation of Shimao International Plaza in Shanghai illustrates a contemporary crossroads of China’s retail landscape. In response to the rise of online shopping and consumers’ appetite for lifestyle spaces that offer compelling offline experiences, shopping malls need to become more than just a physical framework for tenants. Today, in order to draw people in a mall must have a strong identity and be situated within an appealing social context. 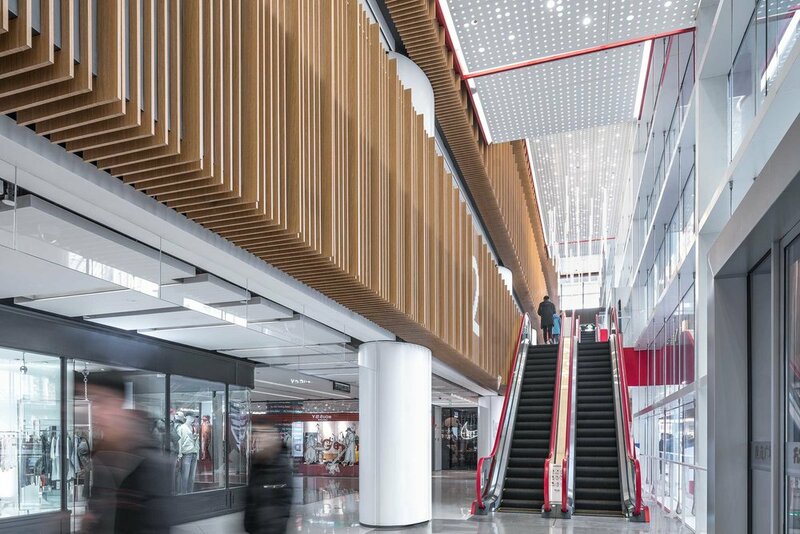 Completed in November 2018, the urban renewal project saw Kokaistudios upgrade Shimao Festival City, the existing retail section of one of Shanghai’s modern monuments, Shimao International Plaza. With reconfigured internal and external circulation pathways and an abundance of open spaces, the mall has helped reinvigorate a prime corner of Shanghai real estate that had become neglected and overlooked in recent years. In doing so, it has placed the mall back on the radar of both residents and tourists, reconnecting it to the city. Shimao International Plaza’s shopping mall represents an interesting case study in Shanghai – although one that is far from unique. As technology and trends continue to outpace development and construction, cities find themselves left with a legacy of large-scale buildings whose original purpose no longer matches the urban lifestyle. With available land now at a premium, architects must therefore find ways to reintegrate these structures back into the fabric of a city. Kokaistudios’ renovation of Shimao International Plaza forms part of a broader urban regeneration strategy for the Nanjing East Road area, and coincides with the launch of Nike’s House of Innovation in the mall’s ground floor space; as well as The Shanghai Edition, which occupies the former headquarters of the Shanghai Power Company. Collectively, these developments offer a sense of contemporary urban lifestyle in an area that had until recently failed to attract a healthy mix of residents and tourists.